Anisakiasis: a growing cause of abdominal pain! A previously healthy man, aged 32 years, was admitted with severe epigastric pain, vomiting and low-grade fever since the previous week. On physical examination, he had moderate abdominal tenderness. Laboratory results showed mild leucocytosis. After a careful interview, he revealed that he recently ate sushi. 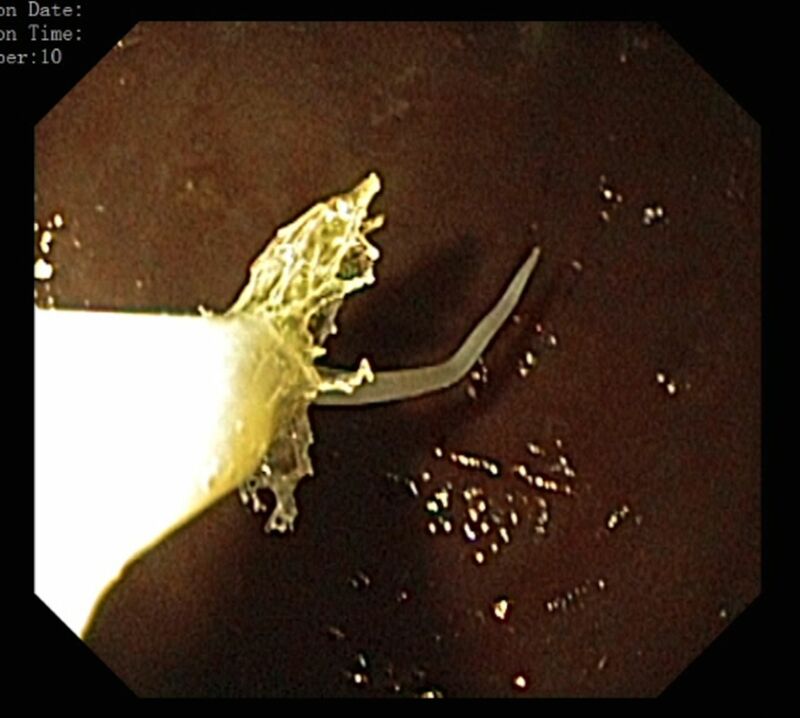 An upper gastrointestinal endoscopy was performed and showed on the gastric body, a filiform parasite firmly attached to an area of swollen and hyperaemic mucosa, with its end penetrating the gastric mucosa (figure 1). The larva was removed with a Roth net and the patient's symptoms resolved immediately (figure 2). Microbiological analysis showed the larva belonged to Anisakis spp. A parasite firmly attached to an area of swollen and hyperaemic mucosa, with its end penetrating gastric mucosa, was seen on the gastric body in an upper gastrointestinal endoscopy. The larva was removed with a Roth net. Owing to changes in food habits, anisakiasis is a growing disease in Western countries, which should be suspected in patients with a history of ingestion of raw or uncooked fish. Anisakiasis can mimic an acute surgical abdomen. Endoscopy plays an important role in the diagnosis and treatment of gastric anisakiasis.
. Gastrointestinal anisakiasis. Study of a series of 25 patients. Gastroenterol Hepatol 2003;26:341–6. Contributors JC and SM did the writing of the manuscript. DS and MB were responsible for the revision of its contents.